However, that does not make you safe from Identity Theft nor does it make your account number safe from the bad guys SELLING it to other bad guys. There are a whole host of other “bad” things that can happen to you if your CC account number gets stolen; such as the hassles you may have to endure if you need to change your account number, and regular monthly charges to the “old” account don’t go through because of that (changing the account number itself is a hassle). So just because you don’t necessarily have to suffer the fraudulent charges doesn’t mean you are safe from other consequences. While there are some alternatives to CC payment, such as PayPal, configured to link with your checking account as the mode of payment (you can use PayPal to pay by Credit Card too), not all vendors use PayPal. But for those vendors that have it, they will just redirect you to PayPal, and PayPal IS SSL encrypted (more on SSL in a bit). However, this article is not about transactions via PayPal. This is about Credit Card transactions handled by the site itself. In Part 1 here, I will deal with encryption as the mechanism for reducing risk. Make sure your vendor uses secure encryption on the transaction page . 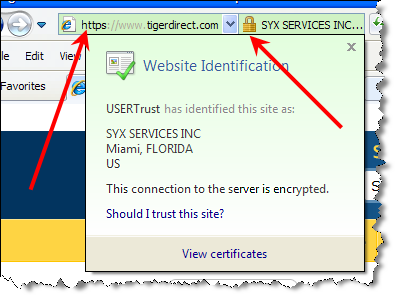 . . indicated by an “https” in your browser’s address bar. That’s not necessarily a guarantee your account number won’t be stolen (more on that in a bit), but if the transaction page does NOT have Secure Sockets Layer (SSL) encryption, then it’s like shouting your account number to a clerk in a crowded brick and mortar store . . . everybody hears you say your account number. If the checkout page is NOT under valid SSL, DO NOT give out any personal information such as your Credit Card number. 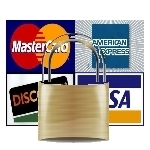 Dave's Computer Tips credit card security, daves computer tips, identity protection, online security. permalink.